Why Didn’t You Go Home? Why didn’t you? You’ve wanted to for years now. No, not just years. Twenty years, thirty years. Every day, like a pistol in your back pocket, like a piece of small talk you keep loaded in a corner of your mind, always telling your sons, your daughter, your nieces and nephews and now your grandson, I want to go home. Yesterday, like every other day, you could have. Six flights that day alone that could have taken you from JFK to Rome. Every day, money to spare in your account or at least enough to get you home and then try to figure it out from there. Every day the long-distance calls with old classmates, or an uncle, or a brother, who promised that they would put you up, would drive you from the airport if you ever arrived. There are people, of course, who really can’t go home. People who are refugees, dissidents, exiles. You know how they feel. You know how the wanting but not going is sometimes a weight even though other times it's nothing at all. But you are not one of those people. You wanted to, and you could have done it many times over the period when the want was there. So why didn’t you go? Was it the time? Was it the inertia of having lived in one place, every year the moss over your toes becoming a little deeper, the grass becoming heavier? Was it your friends who you always said were less friendly than they would have been in Italy? Was it your children who you always said were less cultured, less available? Was it your oldest son, who you nearly ignored until late last year when he learned to speak and the two of you were suddenly like best friends in the corner of the room, chatting urgently in a language no one else could understand? Was it the comfort of this place you despise, and yes, comfort can be despicable sometimes, the big glass windows looking out over nothing at all, the mirrored wall that pretends your one-room apartment continues on forever on either side, an infinite series of old women in small rooms muttering to nobody in particular, I want to go home. You wanted to go, and you could have, but now you can’t. This is what the doctor is coming in to tell you, to tell you what she already told me out there in the hall. I know she will tell you that from today it is your hip that will keep you from going. The arrangement of the bones. The lurch that you made last night into the surface of the mirror that you didn’t know was there, and then the fall onto the cold, comfortable, hard tiled floor. Now you won’t be going anywhere. Not to Rome, not to JFK, not even to your apartment that right now you are starting to realize really is your home. Your home for thirty-two years. Your home ever since you were a scared-stiff bride walking down the gangplank of the Andrea Doria and smelling the copper-soot reek of New York City for the first time. Your home where your children were born and where they grew up. Your home that you arranged through time and stubborn will to be just the way you liked, the way you really wanted. Why didn’t you go home while you still could? Gen Del Raye grew up in Kyoto, Japan and lived there until he was eighteen. Currently he is studying marine biology in Honolulu, Hawaii. His stories have appeared or are forthcoming in The Monarch Review, Kentucky Review, Pithead Chapel, and others. 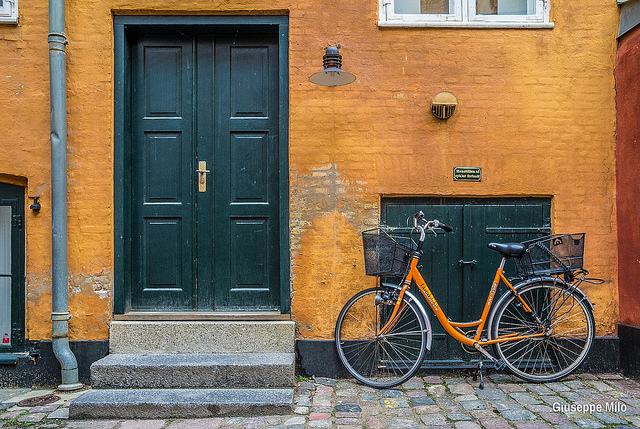 Image: 'Door and bike...' by Giuseppe Milo.